Yes, it’s true: all you need is love. Love of people, music, art, and perhaps a little money for gas to get to the Brandeis Pub at Kibbutz Ein Hashofet. Omer Dayan & Armageddon Jam, with a little help from Sa’ar at the bar, have created a place for music worthy of a pilgrimage from Tel Aviv…or from anywhere for that matter. Midnight East recently made the trip to Ein Hashofet with a little help from my friends for a Hannukah party featuring Kriminal Project, gefilte fish and sadly, no shprots, just sardines. We arrived early enough to hang out at the bar and meet David Morris, a sculptor (see his work at the current group exhibit at the Benyamini Contemporary Ceramics Center in Tel Aviv – til January 14th) and take a peek at his studio. No etchings, but lots of sculpted figures and a collection of delicate pen drawings that may become part of future exhibits. 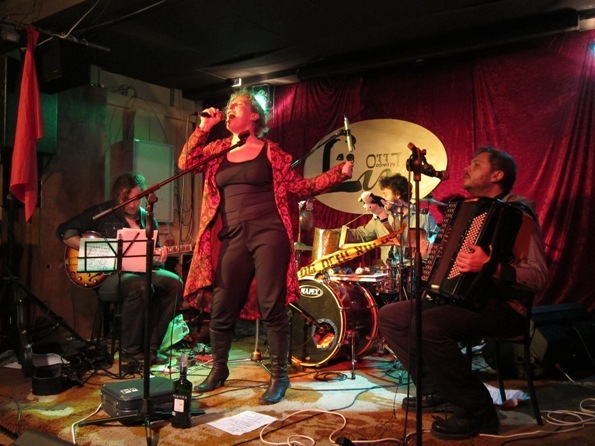 Kriminal Project are outrageously good, their Brandeis gig found them in an unusual configuration – band members Nadia Kucher (vocals), Boris Martizinovsky (accordion) and Stav Ben Shahar (percussion) were joined by Raphael Roginski. An amazing meeting of musicans! Raphael continues his pursuit of “lost ideas, lost music and musical traditions,” the set opened with an instrumental piece by an early 20th C Jewish Russian composer performed by Raphael and Boris, who were later joined by Stav. Then came Nadia. Nadia is a force to contend with – a seductive siren with a voice that can go from delicate to decadent in a heartbeat. It doesn’t matter whether she sings in Russian or Hebrew; you know what this sister is saying, and you will want to hear MORE, MORE, MORE!!! If you weren’t at the Brandeis on Wednesday, you missed the raunchy version of Sasha Argov’s HaPrutza HaHalutza (translation: the promiscuous pioneer) created for Asphalt Journey, an album of indie interpretations to Argov’s compositions, femme fatalistic Russian songs to swoon by, and what is now my favorite cover of the late, great Joe Amar’s (1930 – 2009) famous drinking song. Hoping to be back at Brandeis Pub soon, for updates on gigs – follow Armageddon Jam. If you’re wondering why Armageddon, take a a look at the map and see that Ein Hashofet is in the environs of Megiddo, the literal or symbolic location of the end of the world. All the more reason to party like there’s no tomorrow.